I am done watching TV. I believed the sky in London right now is the same sky we have in Bavaria. Since it's been raining since Friday last week in our place, the more I expected it in London which is a typical weather during spring and Autumn seasons. You can look at the sky in London through my image below. 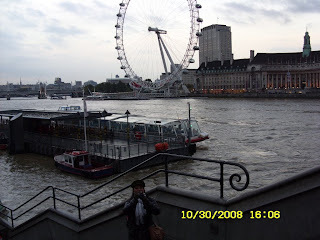 I will also give you a bonus by sharing the London Eye which is also in my picture below. You can also see the River Thames, the famous river in London. I can always remember my trip in England last 2008. Don't forget to find me in the picture below. Goodnight! Ooohh very clever! Love the way you captured the shot and love the picture all round. Lovley capture and scene from London! Hi Euroangel, i just followed your comment from Autumn Belle's as i saw you are also Filipino. Am glad to meet you here, and will keep on looking at your travel photos. May i know where in Cebu you're from. Thanks. The London Eye! From the across the street from Big Ben!